Book a Pagsanjan Falls Day Trip! About 2 hours drive to the countryside south of Manila to the old town of Pagsanjan. Located in Laguna, Pagsanjan Falls is one of the most visited tourist spot south of Manila and is the place where the movie “Apocalypse now” with Marlon Brando was shot. Once the trip starts, you will enjoy the lush greeneries and towering cliffs. Vast rice fields and coconut plantation can be seen along the way. Hop into a dugout canoe called 'Banca' and go where your feet won't carry you. Be prepared to get wet, water runs deep and strong in the Pagsanjan River, benevolent at times but not manageable during stormy weather when rain prods white-water mass racing downstream. Your boatmen's skillful maneuvers will move you upstream. Get your camera ready to take awesome shots of the steep gorges and lush vegetation. 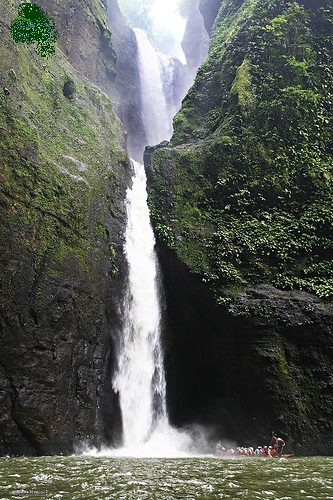 The exhilarating ride will take you to the spectacular Pagsanjan Falls--a jewel kept deeply hidden in nature's bosom. This 300-ft torrential waterfall feeds the river whose roaring rapids make your heart pump harder. At the falls, you may opt to ride a bamboo raft that will take you underneath the waterfalls to experience the thunderous cascade of water. The return trip is another beguiling and thrilling experience as you “shoot the rapids” going downstream. This means the boatman will maneuver the banca between the rocks and boulders. As you shoot the rapids to head back, marvel at how the first adventurers ever mustered the courage to negotiate this wild river until you reach the calm waters of the river. lunch , entrance fees, boat rides and a guide. You might want to bring along, extra clothes as you most probably get wet.